Take your Method fishing to the next level with the Method mix of all Method mixes! 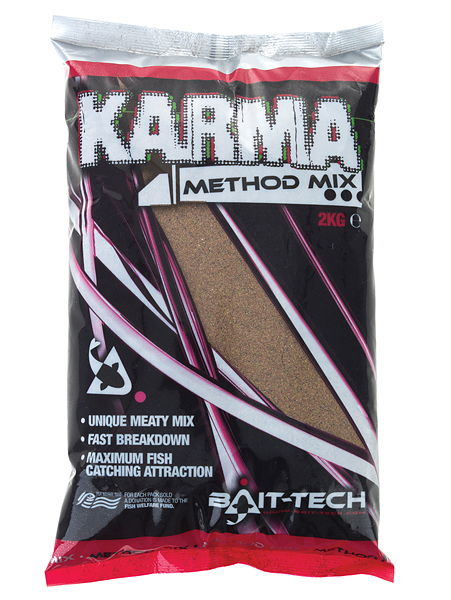 Karma is the new name for our unbeatable blend of fishmeals and meat derivatives. A fast breakdown method mix made with biscuits, fishmeals and meat proteins giving truly unique fish-catching properties. An extra fine groundbait deigned specifically to pack a heavyweight punch when it comes to attraction, with minimal feed. This results in your hook bait standing out like a beacon equaling more bites and ultimately more fish in the net. Many, many anglers know the power of this unusual, fine-ground groundbait which has the pedigree of successfully catching carp, bream and tench. Karma's record speaks for itself having proven to be attractive to all big fish it has resulted in some unbeatable red letter days and match-winning catches since its launch in 2007. This is the top of the tree method mix groundbait. A unique one off - there will never be another like it.